Long before Chicago drink scene had taken the Windy City by storm, Becky Dorsen cut her teeth at some of Chicago’s neighborhood bars. In between serving beer and shots she began to play around with spirits and ingredients to craft drinks. 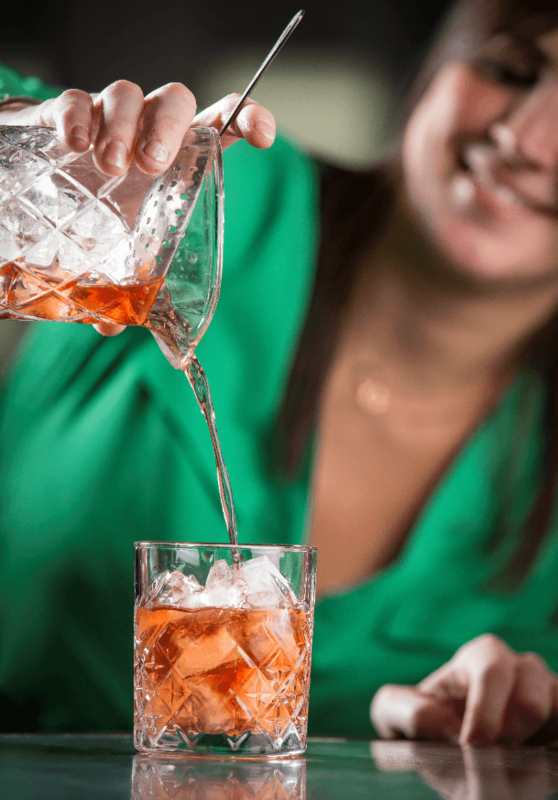 While Chicago’s drinkscape has changed a lot since then, Becky is still tapping into her passion for bartending, creating drinks that are approachable, refreshing and well-balanced and, yes–plenty of fun! “It’s funny because I don’t really consider myself to be a creative person, except when it comes to cocktails,” says Dorsen. Here’s what else Becky has to say about cocktails, Valentine’s Day and where she finds inspiration. I love all of the super interesting people that I get to meet. I like that I get to help guide people to something that they’ll hopefully enjoy sipping and remember. What is your approach to drink-making: style and philosophy? I tend to make a lot of culinary-inspired cocktails. The flavor pairings are endless, and fresh produce and herbs are hard to beat. I also like to research spirits a lot. The distilleries give very detailed descriptions of flavor notes and aromas, and it can be very helpful when you’re brainstorming. Obviously, you need to taste everything too, but there’s an endless amount of spirits, so tasting every single one is an impossible task. Challenge accepted. What are some of your favorite spirits? In the past, gin has been my absolute favorite spirit to work with. There all diverse, and lend so many different flavor profiles to a cocktail. Recently, I’ve been having a lot of fun with rums and piscos. Vinegar. Recently, I’ve been making my own shrubs. Also, fats. I want to see what other kind of fats I can infuse spirits with. I read a lot of cooking magazines; I watch a lot of cooking shows, and, well, I cook a lot. I find that it really helps me pair various flavors together. A cocktail should be just as balanced and composed as an amazing meal. Also, I read several bartending magazines. It’s helpful to pinpoint upcoming trends. Plus, reading about other bartenders is ridiculously inspiring. That’s why I always prefer to sit at the bar over a table. I love seeing how others craft a drink. With Valentine’s Day coming up, what’s your ideal romantic cocktail? Pink! A good classic cocktail to rock on Valentine’s Day is the Pink Lady. It’s pink and has gin and egg whites. What else could you possibly need? Plus, something with bubbles is always good too. Everyone looks red-hot drinking bubbles. I think I would be a Tom Collins. It’s a classic and it’s refreshing, tart and effervescent. I can be sweet but also a bit sour when I need to be. I’m taller than the average female too, so that Collins glass works.